The chef in a Sur la Table video* was so enthusiastic about this method for cooking chicken breasts - even for novice cooks - that I decided to give it a try. He called it a “date night dish.” Also great for a dinner party, it can be cooked halfway through and finished later - or even the next day. With few ingredients and quick prep and cooking times, it has become one of my favorites. However, during my first attempt, one of the breasts came out succulent and delicious - true restaurant quality - and the other was well seasoned, but dry and stringy. So what happened in this tale of two chicken breasts? Follow along to find out. Preheat oven to 400 degrees F. Let chicken come to room temperature for about 20 minutes. 1. 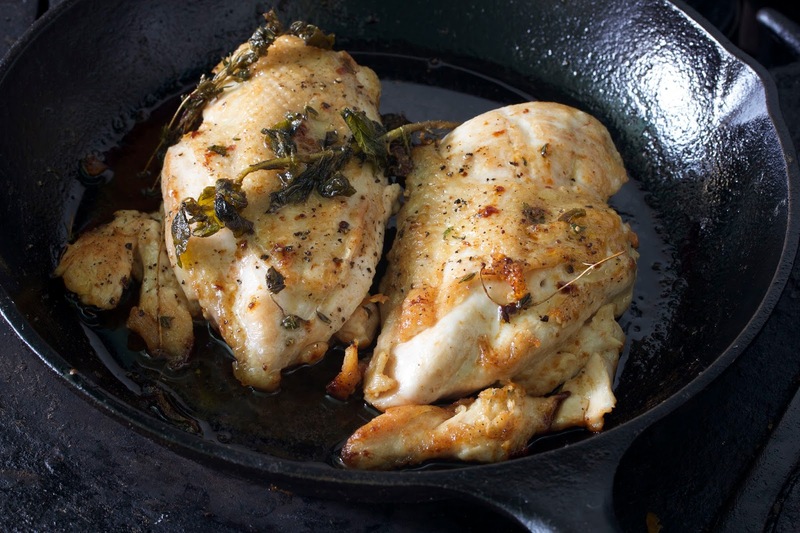 Heat a cast iron frying pan (preferably) until it is very hot - about 5 minutes on top of the stove, or place in oven while it is preheating (be sure to use pot holder at all times). 2. When the pan is very hot, pour in olive oil and allow to heat up just until the oil starts to smoke. Add a pinch of salt to the skin side of the breasts. Place them in the pan skin side down with tongs, laying them away from you so the grease doesn’t splatter you. Cook at medium high heat until a white line forms around the bottom of the breasts and comes up about 20% of the thickness of the breast, about 2-3 minutes. 3. Salt the skinless side of the breasts. Take the fresh herbs and smash with your fist to release flavor. Flip the breasts over (away from you), add the herbs and butter, and allow to sear for another 2-3 minutes. As the butter melts and turns brownish, take a big spoon and baste the breasts with the liquid continuously. Note: Can now be covered and put in refrigerator to bake at a later time - just preheat oven and let everything come to room temperature for about 20 minutes when ready to bake. 4. When ready to finish cooking, put the pan in the preheated oven. For a small sized breast, bake about 8 minutes. For a larger breast, 10 -12 minutes. The key is to use an instant read thermometer on EACH breast individually to see when the temperature reaches 158 -160 degrees. To check the temperature, pick the chicken out of the skillet with tongs, and put the thermometer in the fattest part of the breast. That was my mistake. I checked the bigger breast after 8 minutes, but not the smaller one, and put them both back in for 2 more minutes. 5. Remove each breast when it reaches the correct temperature, and sprinkle with finishing salt. Rest the chicken for half as long as it was in the oven. When you cut the breasts, tilt the knife slightly to the right and slice each breast opposite the grain into 1/4 inch thick pieces. (To find the grain, gently push the breast apart with your thumbs from underneath and look for the lines.) Serve and enjoy. *This cooking method came from a free online video from Sur la Table narrated by Chef Joel Gamoran in a cooking class called “Cooking Mistakes: What Can Go Wrong & How to Make it Right." And yes, he gave a “fix” for overcooked chicken breasts - but the flavor was so good, it was gone before our piece could get back to to the pan to rehydrate with butter or stock.